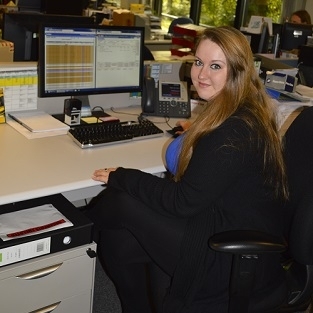 I started the Business Admin Apprenticeship in 2015 when I was 21 years old. The apprenticeship can range from 12 to 18 months. It entails a short period of time at a day release programme at Bath College, adding to an online portfolio and work based learning. The qualification I’m working towards is a Level 2 Diploma in Business Admin and the position I’m working towards in Rotork is a Shipping Clerk; I have worked in the shipping department almost a year now. I export Rotork’s goods to customers in Japan, Italy, Malaysia and Sweden among many other countries. I feel like I make a difference in the team that I’m in, as I have a set job for me and a routine, there is a whole part of the world that I am responsible for shipping Rotork’s actuators to.